Many many years ago, I took up needlepoint as my handwork of choice. 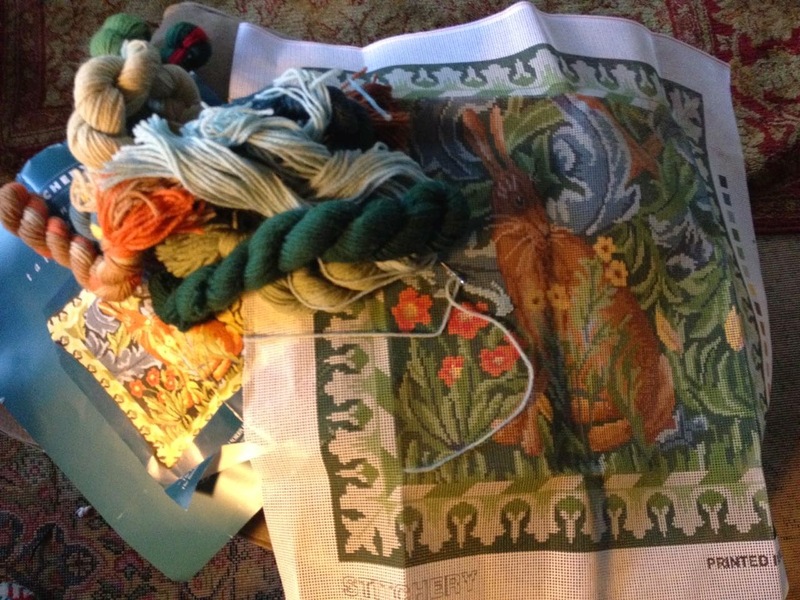 I found a book in the library entitled Mary Martin's Needlepoint and fell in love. Of course, most of her projects were designed by her and painted on canvas by her needlepoint shop. But they were lovely and I loved the stitches. At that time most Department Stores had a needlepoint section. Most of those canvases were worked in the center (mostly flowers) and you filled in the background. I bought one and taught myself. What I did learn was that background is boring. Mindless stitching actually but sometimes that is good for I had a project to keep me busy as I commuted to and fro on the bus. I am not a fast needlepointer (which is a good thing for my output is not great) and after a couple of those Department Store canvases, I found printed canvases! Designs that I could work myself! 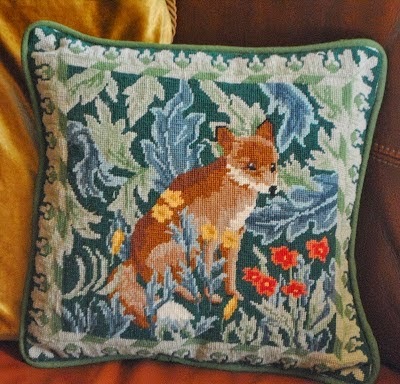 For years, I always had a needlepoint project and soon we had my lovely pillows on chairs. I also found bargello and books which had patterns that you stitched on blank canvas (similar to counted cross stitch). But then Sarah came along and life got busy with motherhood, career, and housewifely chores. I put my needle and wool aside. And there it stayed for a long time. When we went to England that Spring to live, we arrived on board a ship. I knew that there would be days and days at sea and one can only bring so many books so off to The Studio (my favorite KC needlepoint shop) I went and bought a canvas and yarn. Needlepointing is like riding a bike! Everything came back and I finished that canvas while still in England. Of course, needlepoint is so English and so I found a needlepoint shop and bought another canvas (to see me for the rest of the stay and the trip home). And I've had a piece of needlepoint every since! A very colorful canvas -- Jacobean in design. Not picked by me, but picked by Husband Jim as a Christmas gift (shameful to say, Christmas 2012). Now, I've not been working on it since Christmas 2012. I had to finish another canvas and then I had ordered another (before I received my gift) and had started on that one. What I start I finish, before I start on another. This time, I did have a rule -- to only have on canvas at a time. When I am almost done, I order another! That way, I don't have a drawer full of needlepoint kits! I started this one on our trip to Italy in the fall of 2013. And with needlepoint, I pick up and put down. It went with me last year to all of Jim's doctor's appointments and kept me company while he had procedures done. And then I'd put it down . . . and a month or so later, pick it up again. But I've been working on it pretty steadily for the last few months. And today -- just today, I stitched the last stitch. Now to take it to Mary to be transformed into a pillow. And my canvas in waiting? It's a hare. A companion to this . . . The piece I bought the year we lived in England! The hare may go quicker since it's similar to one I've done before. I hope so. For I have another in the drawer. A gift from a dear friend. Oh, and in the fall, I pause my pillow project to make a needlepoint ornament for the Grand girl -- a tradition! Now I'll have two to make! Martha, they are all beautiful. Did Jim find the Jacobean flowers canvas at The Studio also?? It is gorgeous and so colorful! Thanks for showing us these. I love your needlepoint work...You choose such wonderful designs and I admire your finishing them! I am afraid to begin, though I like the idea of handwork.....But my hobby is watercolor and writing....Still, I love the wonderful designs that you use for textile art! Wow Martha, what beautiful work! I've done some needlepoint too and still have a couple of unfinished pieces in the closet. Those are remarkable works of art. I have never tried needlepoint. I love that you are one to start and finish; before starting another project. I wish I had that self control. Too many unfinished projects in my drawers; waiting for a finish. Thank you for sharing your wonderful needlepoint. How beautiful they are, Martha. You know, I have that Mary Martin needlepoint book. I have always been in awe of the little jacket she made for her daughter, cut from a jacket made for her by Mainbocher. I also loved her descriptions of needlpointing aboard ship. Like you, I am working on a project with a hare - many hares, in fact. It's a Prairie Schooler cross stitch - hours of pleasure. You just finished a piece of needlepoint you started in 2012? Ha! Amateur! 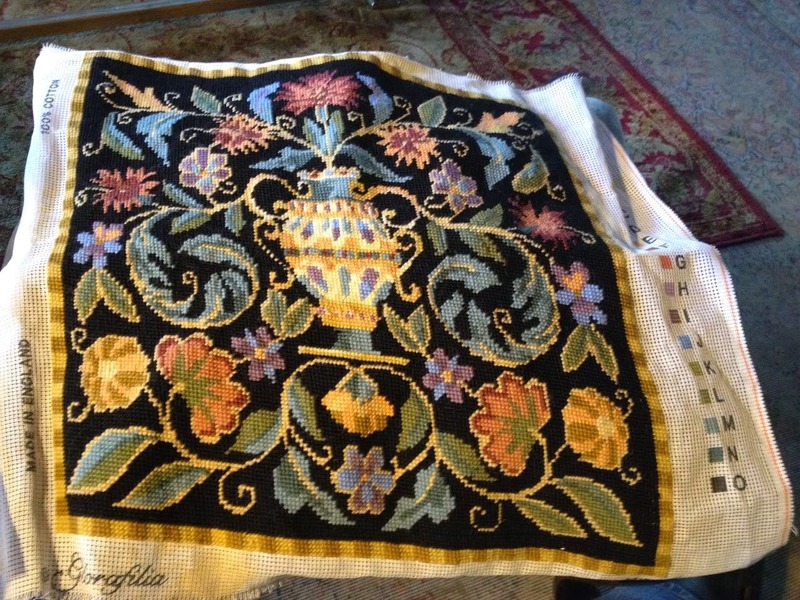 I just finished a piece of needlepoint I started in 1968! I had hoped to have it done in time for Christmas (well, I never said which Christmas, did I?) as a gift for my maid of honor who is a true Anglophile. Last month I decided the pillow would make a nice 50th birthday gift for my daughter who is going to England to visit some of our many relatives this summer. Oh well, better late than never! Martha, your needlepoint is truly gorgeous. I tried it years ago. Mine was okay but nothing so fine as yours. 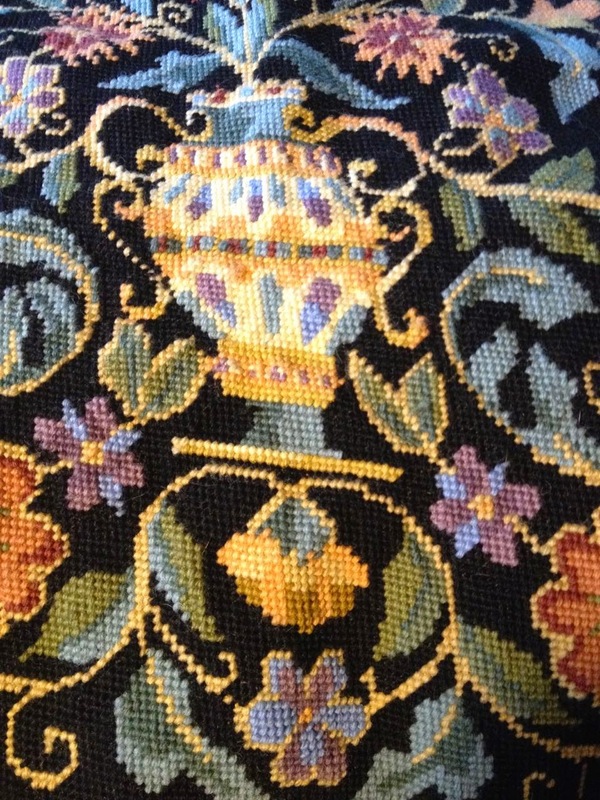 My great grandmother did needlepoint seats for my Granny's long waited for dining room set. I have that set now and a few years ago I had to cover the seats as over the years the edges had worn through and the colors had faded. I could not bear to destroy them, so I covered right over them stapling fabric to the botton not damaging the needlework. I know it is old and worn but I also know when I sit down work of great grandmother's fingers is still there! You do beautiful work. I used to enjoy doing needlepoint, but then suddenly it seemed like there was no time. I think I actually have some packed away that could be finished. When it is warmer, I think I will look in the attic. See -- you have inspired me! Beautiful! I think I have at least 4 pillow kits somewhere in the house. I've done cross stitch and tea towel embroidery, but I feel a bit intimidated to start the pillows. I'm not quite sure how to do the stitches, so I guess I need to sit down with a good book or tutorial. I have this memory of my aunt doing needlework with a box of mini Recees peanut butter cups…remember when they came all lined up in a box? She had lived in England for several years and picked up the hobby there…stitching and eating chocolate! Congratulations on the good news about a new grand! Such gorgeous handwork! Counted cross stitch was my last embroidery interest, years ago. Inspiring! I don't know very many people that needlepoint besides me and my mother, so it's wonderful to find someone else that loves it. Your last one is beautiful!